Have you ever seen mini bell peppers? They about the size of jalapenos, but are sweet and mild. As soon as I saw them, I thought, "stuff them with cream cheese and throw them on the barbecue!" A recipe on the side of the bag suggested doing just that, but to bake them instead. Baking would be okay, but the smokey sweetness of a grilled pepper is a rare treat. Even G-man, who currently says he does not like peppers, snuck a few bites. 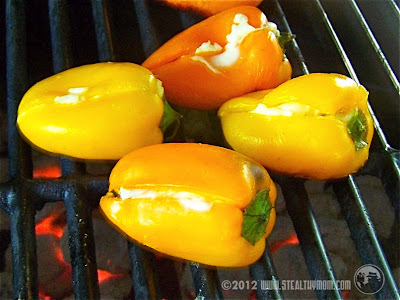 Place the peppers onto a hot grill and close the lid. In about ten minutes, they will be soft will grill-marks on one side. Done! Variation: We bought a jar of hot pepper jelly from a roadside seller. I have no idea what is in it but adding a half a spoonful to the cooked peppers gave some heat to the grown-up's plates.